Our mobile fuel efficient fleet of service vehicles carry a large stock of lighting products on hand to complete any job our clients require. We service all types of lighting on a contract or per call basis and carry a large variety of energy efficient lighting to suit all your needs. Call us today at (604) 872 7731 or toll free 1 (877) 617 2200. 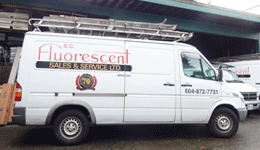 Originally incorporated in January of 1944, BC Fluorescent has been serving the lighting needs of Vancouver and area... click for more. 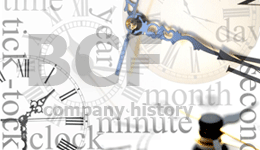 BC Fluorescent has a full service mobile fleet and over 14,000 products in stock in the sales department.... click for more. 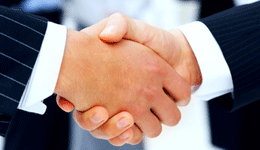 BC Flourescent has built strong relationships with Industry partners to better serve and support our clients... click for more. 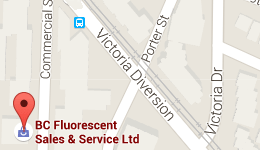 Since 1964 BC Fluorescent Sales and Service Ltd. has been located on Commercial Street in Vancouver.... click for more.